Funeral services for Rachel Victoria (Adkisson) Murray, 81, Hartville, Missouri, formerly of West Plains, Missouri, will be held at 10:00 a.m., Friday, October 5, 2018 in the Rose Chapel at Robertson-Drago Funeral Home. Mrs. Murray celebrated her last birthday by experiencing the joyful reunion with her Lord and Savior and husband of 60 years, Glenn Murray. Rachel, or as Glenn referred to her “Rach”, passed away in the early morning hours of Tuesday, October 2, 2018, at the Hartville Care Center. She was born October 1, 1937, at Gid, Arkansas, to T. J. Adkisson and Addie Dell Bruce Adkisson. She faithfully served alongside her husband in the ministry for fifty-five plus years. Together they ministered in Missouri and Arkansas. She served wherever needed and even when called to play the piano without sheet music, given only instructions “play it in 4 flats please”. All of which complimented her husband’s ministry. 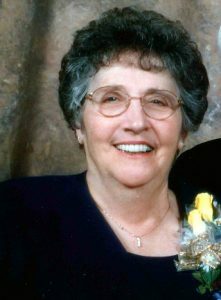 Mrs. Murray worked in Children’s Ministry, held numerous positions in the Women’s Auxiliary, cleaned the church, worked in youth camp many years and at the same time raised a family. Her love and devotion to the Lord touched and influenced countless lives through the years and she is to be praised for all she has done for the glory of God. Rachel and Glenn were married September 24, 1955 in West Plains. She is survived by their five children, Dwight Murray, Pomona, Missouri, Wesley Murray and wife, Judy, Houston, Missouri, Jonathan Murray and wife, Lesa, Poplar Bluff, Missouri, Clarissa Moon and husband, Melvin, Hartville, Missouri and Ronald Murray and wife, Leslie, West Plains; eleven grandchildren, Sarah Rachel Murray, Kyle, Kris and Ellie Horbyk, Kyle Murray, Katie Jo Klaproth, Caleb Moon, Shanda Branstetter, Seth Moon, Gillian Maples and Emma Grace Murray; eight great-grandchildren and one on the way; one brother, Shelby “Amos” Adkisson and wife, Evona, West Plains; one sister, Ernestine Doss and husband, Don, West Plains; five sisters-in-law, Eudene Holt, West Plains, Jane Mackley, Coolidge, Arizona, Joyce Moore and husband, Dwaine, Doniphan, Missouri, Sharon Johnson, Elsberry, Missouri and Sue Stillwell and husband, Kenneth, Doniphan, Missouri; one brother-in-law, Charles Stobaugh, University City, Missouri; and many nieces and nephews. Her parents, husband, one brother, Ernest Adkisson, one infant brother, Junior Ardell Adkisson, her father-in-law and mother-in-law, Jess and Clara Murray, and sister-in-law, Emma Lee Stobaugh, preceded her in death. Visitation will be held from 5:00 until 7:00 p.m., Thursday, at Robertson-Drago Funeral Home. Burial will be in the Howell Memorial Park Cemetery. Memorial contributions may be made to the Alzheimer’s Association or Texas County Memorial Foundation Chaplain Fund and may be left at Robertson-Drago Funeral Home. Our deepest sympathy upon the passing of your Sister and Aunt, Rachel. You and your family will be in our daily prayers and thoughts. May God comfort, encourage, and support each one of you through this difficult time. May God bless you all. Our deepest sympathy to you and your family upon the loss of your sister and Aunt, Rachel. May God comfort, encourage, and support each one of you. You and your family will be in our daily prayers and thoughts. May God bless all of you. We are so sorry for your loss. God bless and keep you all! Family: So hard for us to not have aunt Rachel in our physical world. But I do know that Uncle Glenn and other family members were waiting to welcome her with open arms! She will always be with us in our hearts. Families of Rachel Murray….So sorry we were unable to attend. You all are in our thoughts and prayers. Rachel is healed now and at home with Glenn in their eternal home. God bless and keep you all in His care at this difficult time. We love you all. Cecil and Gladys Murray.